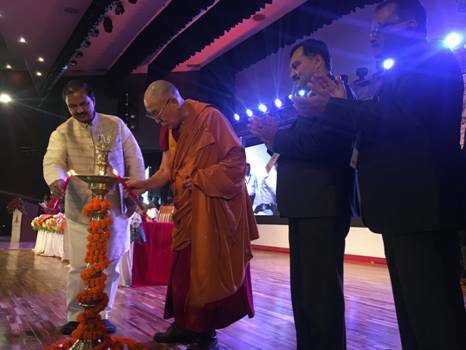 Rajgir: The three days“International Buddhist Conference” organized by Ministry of Culture and Nava NalandaMahaviahra,Deemed University was inaugurated by His Holiness TheDalai Lama andDr.Mahesh Sharma,Minister of Culture and Tourism today at Rajgir International Buddhist Conference, Bihar. Shri N.K. Sinha,Secretary M/o Culture and Shri M.L. 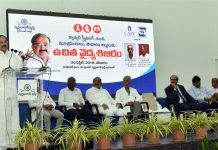 Shrivastava, Vice-Chancellor, Nava NalandaMahaviahraDeemed University were present on the occasion.It was followed by the chanting of Mangala Path(Holy Sutra) by the Monks. His Holiness the Dalai Lama in his inaugural address said that all religious traditions should sit in harmony to know the truth which is always unchanged. That will help the country as well as the World in attaining peace through love and compassion which form the core of Buddhism. He said that we should not only read about the Buddha and his teachings but we should also experience and experiment it in our lives. He said that like violence,compassion is the basic makeup of human being. He emphasized on the refinement of our emotions. The negative emotions that generate within us keep us plagued and diseased. Therefore,we must purify our mind especially through Vipasssana Meditation which is of explanatory kind. He lauded India’s rich religious and philosophical traditions. He reminded us of the Heart Sutra that Buddha had delivered at Rajgir. Dr. Mahesh Sharma in his speech said that he was overjoyed to come to Nalanda, the holy land of wisdom. He said that the most of the holy places related to Buddha’s like are there either in U.P or Bihar. He welcomed the delegates coming from all parts of the world and hoped the conference will prove seminal in the sense that it will pass on to posterity some message. Shri N.K Sinha, Secretary,M/o Culture welcomed His Holiness and the Minister and all the delegates coming from 35 countries of the World. He said it was proudest moment for him to extend welcome to His Holiness, a living legend of Buddhism in the World. He mentionedthe efforts of Ministry of Culture in getting the World heritage site status to the Ancient University of Nalanda. Vice-chancellor Shri M.L. Srivastava, who is also the Joint Secretary in the Ministry, presented a brief history of Nava NalandaMahaviahara,Nalanda and also explained the context of the Conference. He expressed hope that the Mahavihara would try hard to carry the heavy weight legacy of the Ancient University of Nalanda. There were two highlights of the inaugural session. One is the release of the reprint of the PaliTripitaka inDevanagri scriptby His Holiness the Dalai lama. The second highlight was the announcement of the opening of the department of the Buddhist science for the first time in Asia. His Holiness expressed happiness for the opening of the new department because it will hopefully study Buddhism in comparation with science.